Citation: Razam R. "He Has Ridden". Erowid.org. Jan 2006 / Apr 2012. 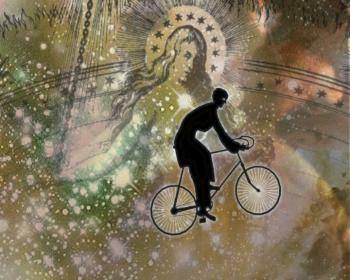 David Normal's "The Bicycle Ride"
I've come to Switzerland to meet a 100 year old man. That might be cause enough in some circles, but this is no ordinary centenarian. 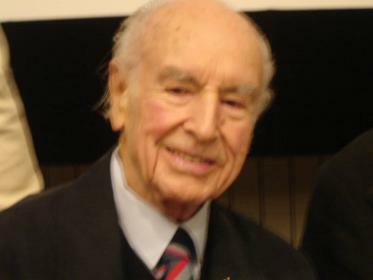 Dr. Albert Hofmann is the Swiss chemist, ex-Nobel Prize committee member, who discovered the unique properties of d-lysergic acid diethylamide, known as LSD (or "acid" on the street) in his lab at Sandoz pharmaceuticals in April, 1943. Basel, the city where all this occurred, is proud of it's prize chemist and is hosting an international Symposium on "LSD - Problem Child and Wonder Drug". On Wednesday 11th Jan, the local paper is awash with respect for Dr. Hofmann and his discovery in a way that no other Western newspaper would. An eight page spread documents his discovery, quotes excerpts from his book, "My Problem Child", and charts the take-up of LSD by the Hippies in the 60s and it's effect on music, culture and consciousness. Bloody great. Later I'm talking about the cultural conceits with a group of 'Heads', to use the '60s term - switched on crew that are all here for the LSD conference, too. The classic media formula when talking about "drug" issues is rise and fall. Apart from a select few archetypes - like Kate Moss or Robbie Williams, for instance, who are allowed to get away with their indulgences, the usual route for people who indulge in drugs is that they must always come to a bad end. Basel, however, will have none of this manichean dualism. The city has hundreds of years of balanced thought and philosophy hanging in their culture milieu. Posters for psychoanalysis sessions adorn the local bus stops. Picasso, Freud, and Mozart exhibitions are on permanent display. The European mind has a long history examining itself, and the use of a chemical like LSD to navigate the labyrinth of the unconscious seems de rigeur in this place. Not that it's legal--but for medical and psychotherapy uses the culture seems totally comfortable with it's potential and proud of its native discoverer. 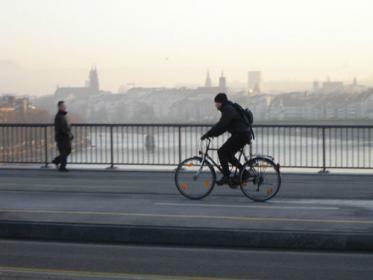 I hire a bike and ride to Basel St. Johann, on the edge of the Rhine, where Sandoz labs used to be. 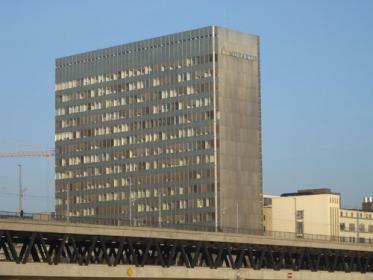 Sandoz merged with Ciba-Novartis in the 1990s, and is now one of the largest pharmaceutical giants in the world. 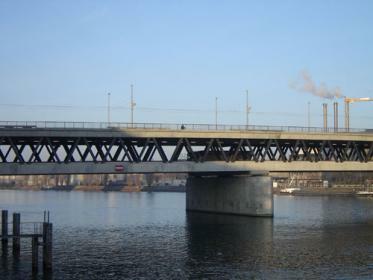 The old labs where LSD was synthesised are gone and a giant, thirty story tower stands over the river, dominating the Basel cityscape. This is the heavy industrial side of town and the docks area where ships unload their goods for all the factories spotted along the river. As I walk along in the late afternoon a light mist takes hold, catching the rays of sun and the pollution let off by the two giant industrial chimneys in the distance. They look like colossal salt and pepper shakers spewing out clouds of gas day and night into the Basel sky. Curious and curiouser this town and the price it pays for it's libertarian consciousness. Passing under the bridge I notice a plush black armchair, empty water bottles, and litter, syringe caps. Illegal injectable street drugs have come to Basel, too - just like everywhere else in the world. The ironic thing is that this is also the pharmaceutical capital of the country, where legal drugs are manufactured and shipped out to the waiting world. By 4:50 pm he had noticed no effects. By 5:00 pm, he noted the following symptoms in his journal: "beginning dizziness, feeling of anxiety, unrest, difficulty in concentration, visual disturbances, desire to laugh." His last written words were barely legible. 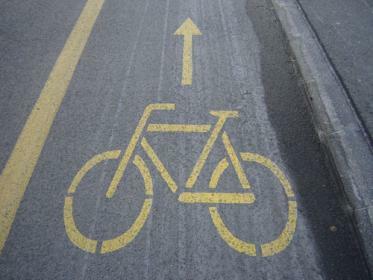 "I requested my laboratory technician to accompany me home; we went by bicycle. My field of vision swayed before me, and objects appeared distorted like images in curved mirrors. I had the impression of being unable to move from the spot, although my assistant told me afterwards that we had cycled at a good pace. v1.0 - Date - Author - Short description. v1.1 - Jul 6, 2002 - Erowid - Corrected minor errors.